Unibet was the main skin of the Microgaming network till the end of 2013. Nowadays the room is independent company with impeccable reputation that hurled all effort into attracting recreational players, primarily from England and Ireland. Unibet incorporates casino, betting, funny avatars and achievements; it does not incorporate wait lists, heads-up tables and table-selecting — perfect for amateurs! Since the room is licensed in England and aimed at the UK residents, the peak times fall on evenings CET and the weekends. The field is soft, the games are played in EUR. The traffic in NLHE is excellent. The peak times offer more than 20 tables at micro-stakes, about 15 tables of NL50–NL100 and 3–4 tables of NL200–NL400. The NL1K tables are available only on Friday. PLO-traffic is significantly smaller. 4–5 tables at micro-stakes and 1–2 tables of PLO100–PLO200, sometimes PLO400. The room offers Fast Poker, but we’ve never seen a soul there. In the evening there’s decent action in SNGs up to €25, mainly heads-up and 5-max. The higher stakes of SNGs offer neither games, nor competition though. The MTT section boasts its good traffic. Daily tournaments with guaranteed prizes of about €1,000, weekly Omaha tournament €1,500 GTD, deepstack tournament €10K GTD and many others attract pleasant lineups mostly consisting out of recreational players. 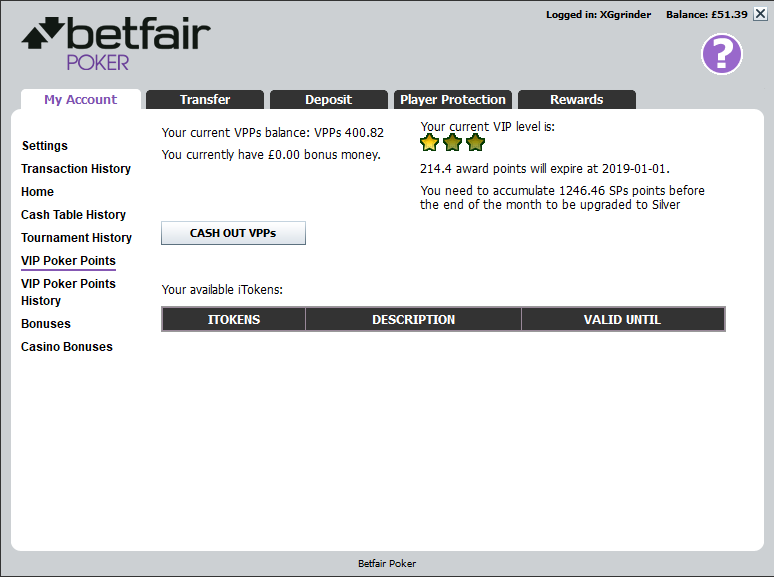 The Unibet VIP system is based on loyalty points. It is ridiculously complicated but we’ll do our best to summarise it. Every time you reach a new points milestone you get a reward which might be cash, bonus or live event entry. In our attempt to give you a reasonable idea of the rewards we have based our calculations in the table below on €1 rake = 100 Loyalty Points. The reward amounts are the cumulative totals. There are actually 60 milestones! Yes 60! But we have listed just a few of them below. And the more you play – the better the reward percentage. But don’t forget that your points reset each quarter. The Unibet’s software is created with players in mind. Players can stay incognito by changing the nicknames as they please. You can’t choose a certain table — the system sits a player at the random table of the game he had chosen (that’s why the pros have to open their stake several times until they see a suitable table). The interface per se is bright and responsive. Since the room is aimed at the recreational players, the main concept of the poker client is the ability to perform various tasks and easily find a game in just one click. The tables look nice, but they are hardly fit for serious multi-tabling. Though there are no restrictions as to the number of the tables open. The Holdem Manager and PokerTracker are forbidden by Unibet. A huge variety of Deposit/Cashout options are available to the players playing on Unibet Poker. Unibet Poker has a long history of fast and reliable cashouts. This room is a good option for those who live in England of just prefer soft European lineups. The rake is affordable, and at the micro-stakes it’s very low at all. The software will suit professionals capable of playing without the HUD, notes and convenient multi-tabling. There are no wait lists, and the deposit bonus is relatively small. But all the downsides will be compensated by huge traffic and soft fields at low- and mid-stakes, the Loyalty-system. Albania, Antigua and Barbuda, Argentina, Bahamas, Belgium, Bulgaria, Burma, Canada, Cape Verde Islands, China, Cook Islands, Croatia, Cuba, Cyprus, Germany, Ghana, Gibraltar, Greece, Guinea, Guinea-Bissau, Iceland, Indonesia, Israel, Ivory Coast, Japan, Laos, Liberia, Libya, Lithuania, Luxembourg, Macau, Macedonia, Malaysia, Mauritania, Mexico, Monaco, Morocco, Nauru, Netherlands, Netherlands Antilles, Nigeria, Niue, Norway, Poland, Portugal, Russia, Senegal, Serbia, Sierra Leone, South Africa, South Korea, Somalia, Sudan, Switzerland, Taiwan, Thailand, Turkmenistan, Uzbekistan, and Zimbabwe.